Looking for Further Study, Career and Migration options? 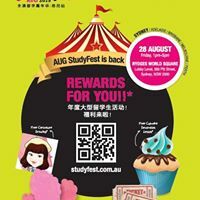 Come join us at the AUG SYDNEY StudyFest to explore your options by speaking to representatives from Universities of your choice, having a 1-on-1 consultation with professional migration agents or by attending the seminars on the event day! Our friendly counsellors will also be available for you on the event day to guide and help you with any questions you may have. We’ve also got some exciting activities and giveaways planned for you on the day! – FREE Movie Tickets for those who pre- registered and attend the event.